The Commissioner does not have an official residence, as in other jurisdictions in Canada. 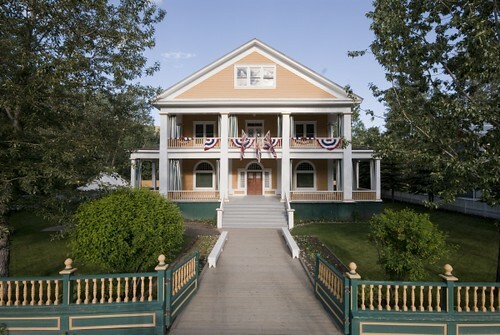 The Commissioner's Residence in Dawson City was built at the turn of the century and is now a Parks Canada historic site. The annual Commissioner's Tea happens each year on the lawns of the grand Commissioner's Residence in Dawson City. The main floor has been replicated to show how the last residents, George and Martha Black, would have lived in 1916. George Black was the last Commissioner to reside there dating from the days when Dawson City was the capital of the Yukon. In the late 1940s and early 1950s the Sisters of St. Anne used it as a residence and senior citizen's home. It sat empty for many years and now after restoration, it stands as a symbol of an era in Dawson City that was opulent and fine. The Commissioner's Residence is certainly the most impressive house in Dawson. Find out more at Parks Canada – Commissioner's Residence. View more photos of the Commissioner's Residence in our Flickr album.